For more than 4 decades, Kit Kats has been developing a variety of wafer and chocolate snack flavors that have made the nation travel all the way to Japan as a tourist spot to enjoy these treats. As a result, Nestle SA (OTC: NSRGY) has decided to build its first Kit Kat factory in 26 years to meet increasing demands. The second factory will operate in the western city of Himenji where upscale, pricier versions of the snack will be produced. Spending by tourists increased to 2.5 trillion yen ($22.5 billion), mostly derived from purchasing candy consumption which tripled over the past 4 years. 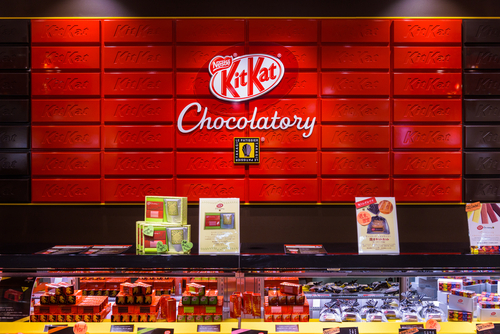 Visitors head to the Kit Kat Chocolatory in an underground shopping center connected to Tokyo Station where Nestle sells high end flavors that can be priced up to 1,500 yen per package. With 30 flavors invented, Kit Kat’s debut started in the United Kingdom in 1935 and has increasingly become everyone’s favorite snack in North America, Europe, and now Japan as the go to tourist spot for this tasty treat.